Site of dilithium deposits and obstinate inhabitants. Seeds or plays on table; any players may download one Constitution- class ship here. Native to this timeline: all cards, and all Equipment cards. Once per turn, one such card reporting at this location may report for free. Characteristics: play for free / report for free. Requires: Original Series , Constitution Class. 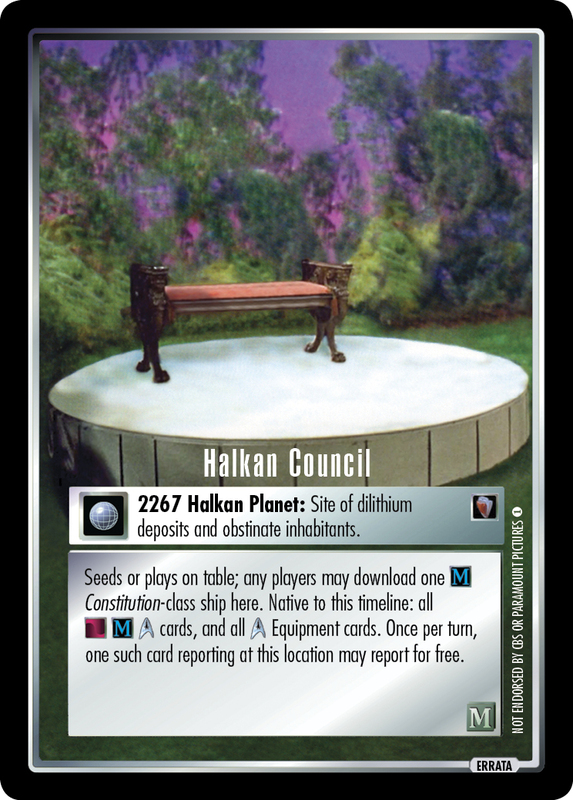 When it was originally released, Halkan Council had a simple job of specifying which cards were native to its timeline. That requirement was the and icons. Unlike Sherman's Peak, there was no mention of . It didn't need it. At that time, all cards were from the episode "Mirror, Mirror", and so of course they were . Now we have Crossover: An Invitation. It adds to your Alpha Quadrant personnel while they report. And so you can report Lt. Dax, among others, as . Bam, she's bizarrely native to Halkan Council for that report. We're now adding as a requirement for nativity, to close that loophole. Game text before errata: "Seeds or plays on table; any players may download one Constitution-class ship here. Native to this timeline: all cards with both icon and icon, and all Equipment cards. Once per turn, one such card reporting at this location may report for free." 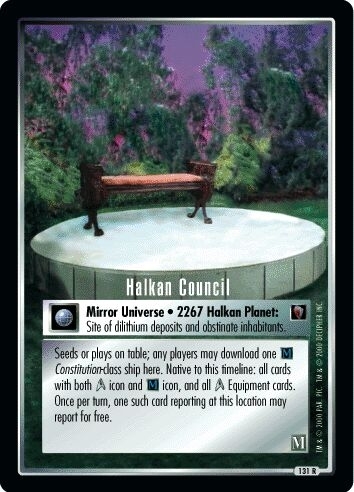 There are 54 entries for Halkan Council (ST1E 11 R+ 131) at the Tradeplace (88 haves and 8 wants). Click here to see all trade list entries for this Rare Plus card!